For more than 50 years, our sale has brought volunteer supporters and businesses together with buyers who care about poverty, peace and global needs. With over 40 venues supported by 2,000 volunteers, the relief sale is a remarkable community event and a beautiful expression of community compassion. Purchase your fundraising dinner tickets today! Check out our 2019 Feature Quilt! 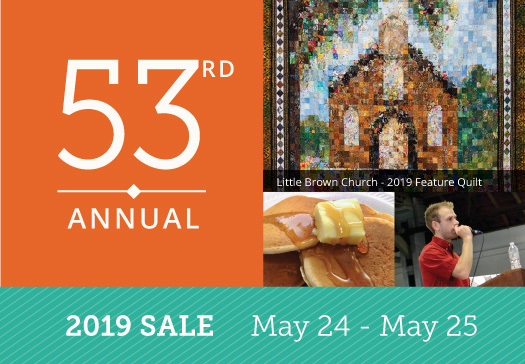 Visit us from May 1st to 23rd to preview a selection of intricate and beautiful quilts which will be available for sale at the New Hamburg Mennonite Relief Sale on May 24th and 25th. View the craftsmanship and choose your favourites prior to the sale in New Hamburg. Schneider Haus National Historic Site is honoured to have partnered with the New Hamburg Mennonite Relief Sale for over 25 years. We look forward to displaying these beautiful quilts year after year. We need you! We are looking for individuals to help at our Friday evening BBQ Supper. Tasks are helping with serving and clean up. Shifts are approximately 2 hours. Contact John Reimer: john.b.reimer@outlook.com or 519-662-4315. All Sale proceeds sent to MCC Ontario!